SKK Mobile announced their quad-core android smartphone last Saturday, the Phoenix G1. 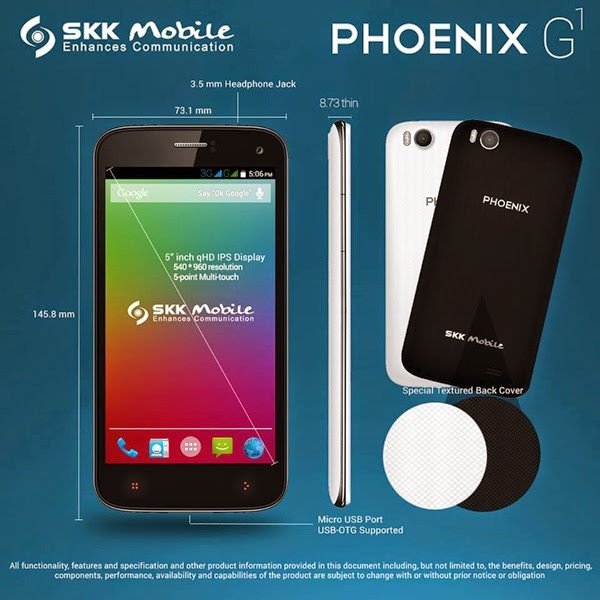 For Php3,799 price tag, SKK offered the Phoenix G1 with 5-inch IPS Display. It is powered by a Quad-core chip clocked at 1.3GHz, Mali-400MP GPU and 1 GB of RAM. The SKK Phoenix G1 has an 8 GB internal storage that can boost up to 64 GB via microSD card. This Dual-SIM, Dual-standby smartphone is equipped with 8 megapixel autofocus rear camera w/ LED flash and a five megapixel on front. Runs on an Android 4.4 KitKat and carried 2,000mAh battery module, the Phoenix G1 support HSPA+, 3G, WiFi, Bluetooth, GPS, A-GPS and USB OTG. G1 SKK Phoenix G1 allowing user to shift photos in gallery, track in music player, taking photos, browsing the home screen and lot more by waving their hands on the smartphone. It also has an Intelligent Wake Up feature, user can draw some gestures while the phone is in sleep mode to launch some actions.